I loved being a student. I was a good learner; I was responsible, and I did well. Oh yes, I was one of those girls. But I think what I liked best about it was the clarity I received as to how I was doing. The results of my labor were given neat little grades that to me didn’t really represent how much I had learned, they represented my identity. I was an ‘A’ student. Instant feedback on what kind of person I was. I lived for those little letters. And I gave myself permission to feel good or bad about myself based on them. And if I wasn’t sure how good I really was, there were those helpful teachers who posted the class standings. That was even better. Perfection was attainable. And it was all represented by a little “#1” next to my name. Teaching was almost as good. We got evaluated twice a year, and there was a list of things we had to achieve. Those little checkmarks became the basis of whether or not I considered myself a good teacher. It was harder than being a student, not nearly so cut and dry, and there were a lot of things about teaching I was not naturally good at. But at least I knew what I had to attain to, and therefore I had a basis to determine whether I was a “good” or “bad” teacher. I think this is why parenting is so hard for me. There are no grades, no report cards, no checklists. No standard by which to measure myself. What’s that you say? The Bible? Well, yes, that. But that’s so general. Love your children; discipline them; bring them up to know the Lord. Teach them Scripture. That’s not good enough, my heart says. How do I know what is enough? My kids themselves don’t even help, really. At least in marriage, you know whether or not you are doing a good job being a wife, because your spouse makes it abundantly clear. But in parenting? Not with small children. Never has my child said to me, “Mommy, you’re spending too much time on the computer today.” “Mommy, I’m feeling neglected.” “Mommy, you need to be more creative.” They just accept. They tell you, “You’re my best Mommy.” And your heart melts. But then I think, Am I really the best Mommy? He doesn’t know any better. So for lack of a checklist, I compare myself with others. Constantly evaluating. Are my children as obedient as hers? Am I as creative as that mom? Do I spend the same amount of time with my children as she does? The internet only makes it worse. Because now, instead of just comparing myself to the dozen or so moms in my circle, I now have the entire world with which to compare myself. The internet is full of perfect moms. Moms that do all kinds of things that I don’t do. Moms that create amazing art projects out of toilet paper and lint. Moms that make birthday cakes to look like a dollhouse with real working faucets. Moms that teach their kids French at age 2. Moms that have their kids butchering chickens and milking cows. Moms that make sensational scrapbooks for each and every year of their children’s lives. Moms that are better cooks than me. Better disciplinarians than me. Far more creative, with lots more energy. Moms that enjoy parenting more than I do. Even moms with better blogs than mine… Imagine that. And what am I left with? Guilt. Constantly. Feeling like my kids deserve more. I struggled with whether to write about this because I’m still in the middle of it. Usually I want to write about something I have struggled with, not with something I am struggling with. So that then I can delightfully end with a marvelous conclusion of how we all lived Happily Ever After and everyone can learn from my Great Example. First of all, please don’t comment about what a great mother I am. That’s not what I am looking for. And truly, unless you have spent a day at my house as a fly on the wall, and I don’t know you are watching, you really don’t know what kind of mother I am. Only God and my children really know, and they won’t start talking about it until they are teenagers on instant messenger with their best friend. Or their therapist. But I’m trying to find some kind of balance here. Guilt can be good. It can show me where I am being selfish and lazy and impatient. So I can’t totally ignore it. Because I am not anywhere near a perfect mother, by anyone's standards--let alone God's. But somehow I must come to peace with the fact that there never will be any grades or checklists or class standings. Even my own kids will not necessarily be an indication of the kind of mother I was. I could be a fabulous mother and still they could make bad choices. Or I could be a selfish mother and by God’s grace, they could turn out great. We’ve all witnessed both. But I think that the most important thing God wants me to learn in this season of my life, is to get away from the checklist mentality. God doesn’t work by checklists. I could be satisfied with myself in school and as a teacher by those letters and checkmarks, but did I even consider God’s standards? Man looks on the outside, but God looks on the heart. But it’s so easy to look on the outside when evaluating ourselves. But what about my heart? And I know that is what matters. Is my heart unselfish with my children? Am I putting their needs above my own? Am I making choices that will please God and bring Him glory? Oh, but that’s so much harder to measure. And no one can measure it, except for God and how the Holy Spirit convicts me. And in all honesty, it forces me to be harder on myself than I really want to be. Can’t I just do these three things every day and be a good mom? Nope. Doesn’t work that way. God expects more than a checklist. His grace is always there, and my salvation is not based on my performance, but He will never be satisfied with sinful mediocrity in my heart. The social welfare office for the Kinondoni district is in a large, warehouse-type building. Cement floors, high ceilings with windows around the edges. The windows are unscreened and always open, allowing birds to fly back and forth among the rafters. Six large ceiling fans dangle, and provide the only means of airflow, at least when the power is on. The room is filled with rows of cubicles, which may or may not contain a computer and always have stacks and stacks of files crammed along the walls. The cubicle of Mama S is down the first row, all the way to end on the left. I love Mama S; I really do. I've worked with a dozen or so social workers through my adoptions and she is definitely my favorite. A tiny, middle-aged woman with short hair and a gentle smile, I really get the impression that she cares about what she does. She is always nice, always patient. Way back in July, when she was doing our home study and interviewing our references, she was also more thorough than any other social worker has been. And she got through them faster than any other social worker. I was excited. This will be our smoothest adoption yet! I thought. She told me it would take her two months to write the report. I thought that was a long time, but I begrudgingly smiled and agreed, since she had been so nice. So I waited until the end of September before I asked her about it again. I kept calling, and sending text messages, and coming up with reasons to go visit her. She was always nice, always polite, just as sweet as ever. But the report just never gets done. I'm positive she doesn't want a bribe. After our home study, she wouldn't even take the taxi money we offered her. I'm positive she's not pulling a power play on us, lording it over us that she has the power to postpone our adoption. (That has happened before with others.) I think she's just busy. And it's hard to get mad at someone who is busy. Helping with adoptions are only one of many tasks she has to do. I went to visit her again yesterday. I counted: There were 17 people waiting outside her office. It's always an interesting experience, waiting outside of Mama S's office. It's usually mostly women waiting, some with babies strapped to them. One of the babies was restless and whiny until the mama rustled around in her shirt, pulled out a breast, and stuffed it in the child's mouth. A man came out of the office, seemingly crumpled on the ground, pulling himself along with flip-flops on his hands. A polio victim, most likely. Yet he had on a button-down shirt and dress shoes on his useless feet. I'm pretty sure he works there. No one seemed as impatient as I felt; a lot of the women had their eyes closed. I sat on the narrow bench in the hallway for an hour, wishing I had my Kindle, and then remembered that there is no "line" to get in to see the social workers, and if I ever expected to get in there, I'd better stand. So I positioned myself right by the door, and jumped in as soon as the next person came out. That's how you do it in Africa, and it's not considered rude. Mama S looked sheepish this time. She apologized for not doing the report, and acknowledged that we had been waiting a long time. She said she would work on it this week. She's said that before, so that still doesn't give me a lot of hope. If she hasn't found time to work on it in the last five months, when will she find time to work on it? As always, adoption is a miracle--just like birth. When it happens, God will get the glory. Change How You Think About the Poor! After several years, the pastor noticed....enthusiasm was waning... Finally one member spoke up, "Pastor, we are tired of trying to help these people out...their situation never improves. Have you ever noticed that there are no men in the apartments when we deliver the toys? The residents are all unwed mothers who just keep having babies in order to collect bigger and bigger welfare checks. They don't deserve our help." If you donate money to charities, you need to read this book. If you have been on a short-term missions trip, you need to read this book. If you work at Farm Drive with Hillside or the Spanish Ministry with FCC, you need to read this book. 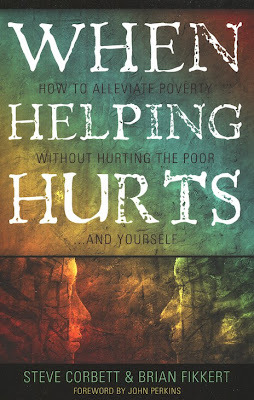 If you have a passion for helping the poor, you must read this book. This is an extremely important book. I can't emphasize that enough! I can't tell you how much this book excites me. It has empowered me. It has given me answers where I thought there weren't any. I have written about poverty before. It is a subject near and dear to my heart. I grew up in Africa. I spent nine years volunteering with Friends at Farm Drive and Faithblast Kids' Club in Santa Clarita. I spent two summers working at Camp May-Mac, for inner-city kids. Now I live again in Africa, and I am literally surrounded by poverty, right on the other side of my fence. I have struggled and wrestled and felt guilty when I didn't give and felt guilty when I did give because I didn't want to create dependence. And I never really knew how really to help. Then I read this book over the Christmas break. And I am in awe. "Poor people typically talk in terms of shame, inferiority, powerlessness, humiliation, fear, hopelessness, depression, social isolation, and voicelessness. North American audiences tend to emphasize a lack of material things such as food, money, clean water, medicine, housing, etc....This mismatch between many outsiders' perceptions of poverty and the perceptions of poor people themselves can have devastating consequences for poverty-alleviation efforts." Do you get it? Do you see what they are saying? When we simply give material things to poor people, it actually makes things worse! Why? Because material things are not the answer to their problems (except in emergency situations)! As illustrated in the story above, material things don't give poor people confidence, security, hope, community, and a voice...which is actually what they need! All it does is perpetuate their idea that they can't do things themselves, they have to rely on rich white people to do it for them. I've only cracked the surface of the richness of this book in this post. It is powerful; it is life-transforming; it needs to be read by every American Christian. It takes a biblical worldview and lays it over the problem of poverty, helping us to see it in a completely different light. It challenges us to think entirely differently about how we go about helping people. It's not saying we shouldn't give; it just tells us the right way to give. "One of the very biggest problems in many poverty-alleviation efforts is that their design and implementation exacerbates the poverty of being of the economically rich--their god-complexes--and the poverty of being of the economically poor--their feelings of inferiority and shame." Please read this book. Then let me know how it changed your life too. She has a relative that lives about 10 minutes away from the hospital, and decided she could handle living there. The doctor said it would be okay. William called me and asked me if it was okay with me. Okay with me? As if I would know. So she was discharged on Thursday. I told him to make arrangements with a taxi driver nearby who could pick her up at any hour of the day or night if needed. He said he had already thought of that. Dr. Carolyn spoke to Stella's OB doctor. The doctor said he was very optimistic. Yes! That's what we like to hear! The baby is due in April. The doctor will continue to monitor her often. He will re-admit her to the hospital a few weeks before she is due. Let's pray her through the next three months! I'm excited about Five. I was an elementary school teacher in my other life, and I taught kindergarten for a couple of years. I know Five. Grace is very excited about it too. I think she was disappointed, though, that she didn't get to start kindergarten or lose her teeth or ride her bike without training wheels the very next day, since she knows all those things come with Five. Dar es Salaam may be hot, sticky, suffocating, hot, humid, hot right now, but believe it or not, not all of Tanzania is like that. Dar has the stereotypical tropical climate that you might think of when you think of Africa, but really, not all of Tanzania is this way, or all of Africa, for that matter. We've said many times that we really wish HOPAC could relocate, because we would be out of here in an instant! We got to spend the week after Christmas in one such place. Lushoto is in the mountains, about 6000 feet (I think)--a six hour drive--so the climate is entirely different from Dar. Gone are the palm trees and the humidity, in exchange for rolling green hills, waterfalls, and crisp, cool air. Just what we needed. Muller's Lodge is a converted 1930's German boarding house from the days of colonization. It's wood and brick, surrounded by hydrangeas and daisies and eucalyptus trees, and has a fireplace in the living room. Truly blissful. We've been there a few times before, but this time was by far the best, because about 7 other HOPAC families and couples (and some singles!) came up as well...we practically took over the place! There was always someone to talk to, always someone who wanted to play Settlers, and I hardly saw my children all week because they had so many friends to play with. We may have told you on our Home Assignment that we were really praying that God would deepen our friendships this term, and bring us new ones--especially families with little kids. That is exactly what God has provided. We are beyond blessed! Then the grown-ups just couldn't resist the fun! Until everyone had joined in! ....until about 9:30, when Gil attempted to open a window to let in some air....the window broke, blood started spurting out of his arm, and the party abruptly ended! Thankfully, a friend of ours is an RN, and she instantly took over. They took him to a local Catholic hospital, and he had 3 internal stitches and 5 external ones...all by a surgeon with his pants on backwards. It was an eventful New Year's! He didn't cry; he didn't throw a fit....he did hold the microphone; he did move his lips, but I really don't think any sound came out of his mouth. This one, however, was born for the stage. A few days before Christmas, we had a special buffet lunch at the Movenpik Hotel with good friends, complete with clowns and face painting for the kids!